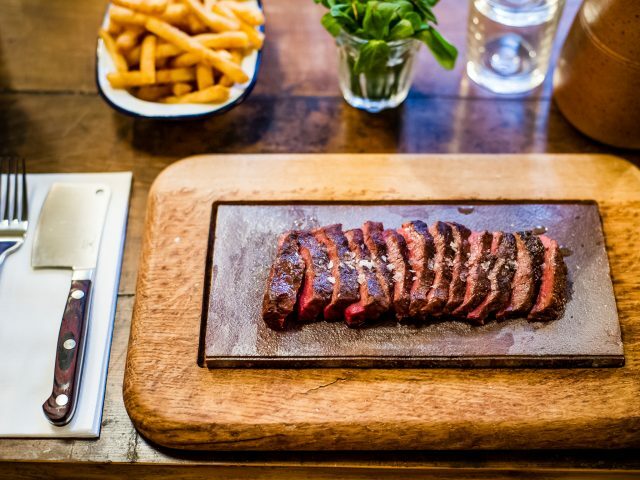 Flat Iron, the popular affordable steak restaurant that champions underused cuts of beef, is to open its seventh site on Tooley Street in London Bridge later this month. 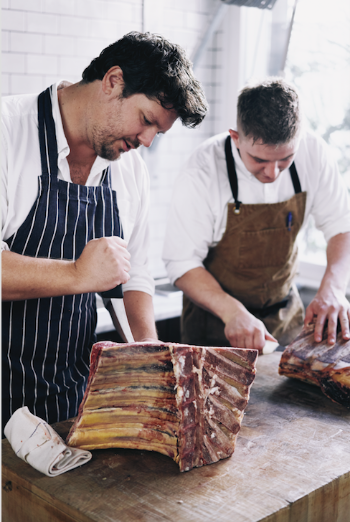 The brainchild of self-taught butcher Charlie Carroll, the 106-cover Flat Iron London Bridge will open on 21 January. Flat Iron started life as a pop-up in 2012 and its ethos of doing a small number of things well has remained the same since then. The restaurant specialises in the flat iron cut, taken from the shoulder of a cow. Less expensive than the likes of rib-eye, but full of flavour and marbling, its lower market price allows Flat Iron to sell the steaks for just £10. It also offers a number of other carefully sourced and butchered underused cuts. Cut into strips, the steaks come with a house salad and a number of side and sauce options, including dripping fries, roast aubergine, and béarnaise sauce. Carroll was keen to make steak available to everyone, rather than the lucky few. His seventh site in London Bridge boasts interiors by Avroko, and comes complete with a brass shop front and solid wood parquet flooring. The front of the restaurant has been designed to look like a traditional pub tavern and includes a six-metre mosaic of over 10,000 pieces made by Gary Bricknell. On the zinc-topped bar you’ll find a carefully curated range of draft beers and an exciting sounding “pour your own” Blood Orange Negroni fountain made with Tarocco blood orange juice and cold extracted Israeli blood orange oil. The dining room has a “secret garden feeling”, with stone flooring and an old copper fountain, while a bookable private dining room downstairs seats 12. Unique to the London Bridge site will be a signature Baked Alaska dessert that’s finished at guests tables with a blowtorch for added theatre. “We’ve spent many happy hours dreaming up what the Flat Iron version of a pub or tavern might be, so working on this project has been great fun. As ever, we want to do a small number of things but do them really well. We’ve come up with a new wild mushroom sauce which is banging,” Carroll said. In addition to the new Tooley Street site, Flat Iron has two sites in Soho, along with restaurants in Covent Garden, Shoreditch, King’s Cross and Notting Hill. The Tooley Street site will be open for lunch and dinner seven days a week.